Even though our fall farm work isn't done (we haven't even started seeding yet—waiting for rain), I've been getting the itch to start some house projects again. On a whim Mom and I decided to stop at a flooring store the other day. I've been dying to ditch the old blue carpet in the girl's bedrooms and my mom has been dreaming of new wood floors for her living room. And of course, I'm always keeping an eye out for wood for my own living room floors, though I wasn't sure we would get around to tackling that this year. Nevertheless, it was the latter that presented itself. Right inside the door of the flooring store was an in-stock (less than a 1/3 of retail price) deal on some solid, 8" wide plank solid wood that we both loved. The wood is a rustic hickory. I like things clean and modern and I love very dark wood floors, but I also wanted a floor that wouldn't show every little scratch and spec of dust. This color seemed just right. We brought home a sample and it passed my dad's scrutiny (the ultimate test). My mom ruled it out for her house though because the planks felt too wide for her smaller space, but it looked great in our living room against the fireplace. On top of that, we recently received insurance payments for the hail damage on our roof and gutters. The guys opted to do those repairs themselves, so we have that money to spend on flooring instead and, well, the deal was just too good to pass up. So, its a bit surreal and I'm quite giddy to be getting new living room floors soon! Over 900 square feet arrived at the store this afternoon and is ready for us to pick up. It is enough for our living room, den, and master bedroom. It will likely sit around for quite a while before we have time to lay it. It will be even longer before we can move a couple of walls in our master area and lay that section of flooring—maybe even another full year—but we wanted to purchase the flooring all in one batch so it would match. The white wood sample (above right) was an option I was considering for the girl's bedrooms, though I am still looking for a less expensive alternative. I've had my heart set on white wood floors in those bedrooms (I would of course put down nice area rugs for softness). Eva's room is north facing and a little short on light, and I know white floors would brighten the space so much. 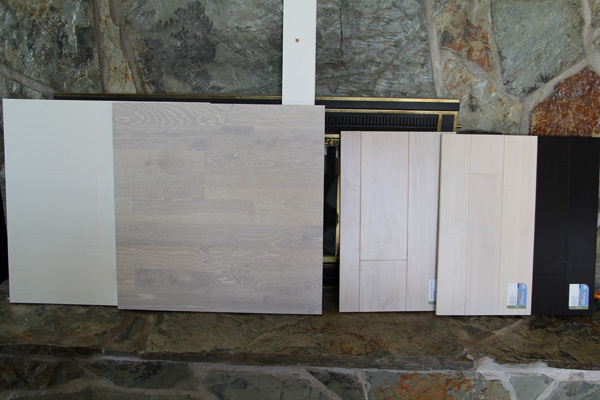 My ideal option is prefinished white-stained oak. However, for cost effectiveness I would settle for unfinished oak and stain it myself. 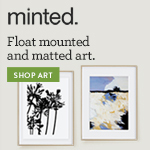 Even less expensive would be unfinished pine, painted white. (White stained pine would probably yellow too much). I like this option but my dad does not. Tom just thinks we should do carpet, but I want a light color. Light carpet is not a good idea at my house. I've even considered Pergo laminate floors. On another note, I've been considering what to do with our living room fireplace. The rock on the fireplace surround is absolutely staying. 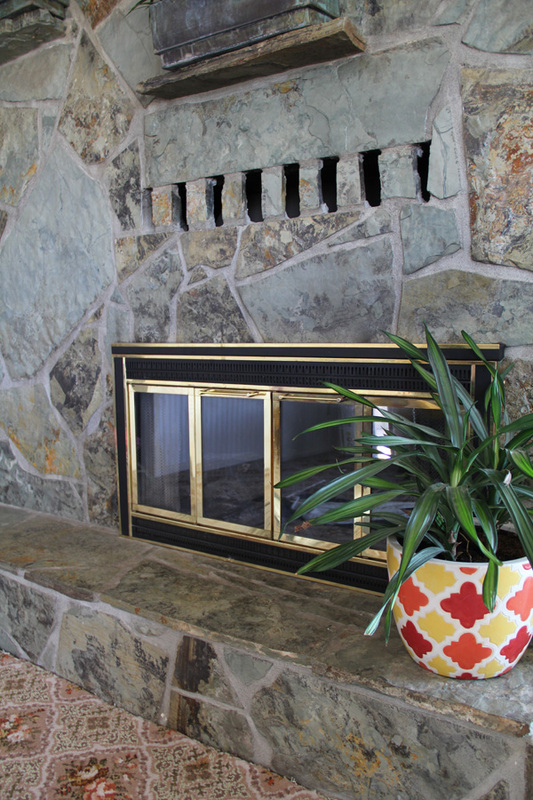 It's a huge fireplace, and we really love the green and rust colors of the slate. It is called "Montana Picture Rock" and was quarried from the nearby Rocky Mountains. Some of the rocks have leaf fossil prints in them. It is the actual fireplace portion I'm concerned about. Our long term plan has been to have gas inserts installed. However, it is double-sided, so insert(s) would be spendy. Lately I have been reconsidering. We don't need the fireplace for heat (unless the power goes out). We mainly want it for ambiance. It currently has gas log inside, but we haven't been able to use it because the propane valve (outside the fireplace) has a leak. That needs to be fixed anyway, so I'm thinking we should get that working and just use the gas log, leaving the current doors in place. While I don't hate the brass trimmed doors, they certainly aren't pristine. Nor are they modern. I think brass is starting to come back into trend, though. My question is, should I paint the brass parts black? Or leave them?